This last week in Seattle has been absolutely gorgeous (minus this rainy weekend!) where it was even warm enough to forego a jacket, especially having it still being Winter and all. It's been the perfect weather to take a walk around the cutest neighborhoods in Seattle as well as one of my favorite parks and I've been able to adventure with Jordyn. I haven't been inside the SAAM (Seattle Asian Art Museum) in so long, but hopefully I'll be able to go see some exhibits soon, but for now, the scenery and architecture around is more enough to enjoy. I kept this look casual since it's something you can usually find me in: chucks, distressed denim, and sunglasses. 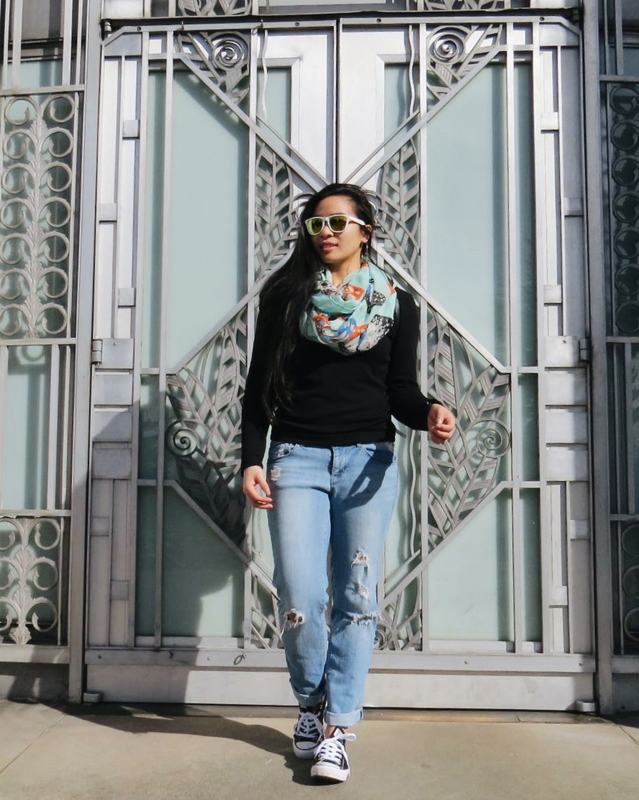 I wanted to add a 'pop' to my outfit and this scarf that was gifted by my friend Adri for my birthday/Christmas was perfect with the light robins egg blue color and butterfly print which definitely reminded me of Spring! I'm hoping the sun comes back this week and I get to play around with some more of my outfits and accessories that don't get as much attention during the colder months, mainly because it is cold and I can get lazy =P .